Home Uncategories Fire Ausmus? Are you crazy? Fire Ausmus? Are you crazy? The Tigers lost to the Washington Nationals on Monday night. 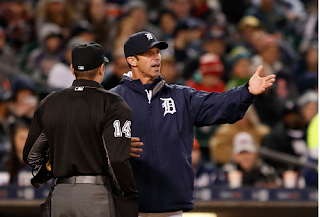 That loss, including the three losses in the 2014 ALDS, put Brad Ausmus's official record with the Detroit Tigers below .500 for the first time, at 178-179. The Tigers are now on a seven-game losing streak, and the howling for the head of Brad Ausmus has reached fever pitch. Folks, that ship has sailed. I'm not a defender of Brad Ausmus. I never really have been, not since January of 2014, before he even began managing the team, when he went on local Detroit radio and said that he was most definitely not a "sabermetrics guy." Boo, hiss, go home. But the time to fire him was at the end of 2014, when his bungling of the bullpen all season long finally got the team swept in the first round of the postseason. The time to fire him was at the mid-point of 2015, when the organization parted ways with general manager Dave Dombrowski and started re-configuring the front office right after the trade deadline. The time to fire him was during the 2015/2016 offseason, when the team was rebuilding the roster under the new executive management of Al Avila. The time to fire him is not now, mid-season, when the team is already scuffling. Zero good can come from taking a team that is showing unsteady legs and faltering footing, and "shaking things up." That's the stuff that empty-headed football fans say when they've had a few too many and decide to call the local sports radio show: "this team needs a good shake-up." In the immortal words of the great Ulysses S. Grant, "No, they f*cking don't." What this team needs is at least two dependable starting pitchers to complement Jordan Zimmermann. Either Justin Verlander or Anibal Sanchez -- or, even better, both of them -- can be part of that equation, or maybe the team will need to acquire another starting pitcher at the trade deadline, but one way or the other they need to fix that hole in the boat. The offense is always going to be a bit streaky. That's how baseball works. And sometimes, when the offense can only put two or three runs on the board, the team is going to have to rely on a starting rotation that can say "cool, we'll make that work," and then pitch a shut-down game. If the starting pitching is going to allow four runs per game (and that is what they're averaging during this seven-game skid) and then say, "good luck offense, you're gonna have to score us at least five again tonight!" then this is going to be an ugly season. If the starting pitching is going to continue only averaging five innings and some change per start, and expect the bullpen to shoulder three-plus innings night after night, eventually that bullpen is going to crack. That is exactly what's been happening over the past few games, in fact. Justin Wilson's giving up runs, Mark Lowe's giving up runs, Alex Wilson's giving up runs, Kyle Ryan's -- look, you get the idea. It's not just one reliever who's struggling, they're all suddenly showing signs of overuse at once. Everything depends on the starting rotation right now. The sickness that they're carrying is spreading out and making the offense and the bullpen look worse than they should. That, in turn, is exposing the weaknesses of Brad Ausmus as a strategist. He's just not good enough to handle the intricacies of in-game management when the wheels start coming off and he can no longer push the automatic buttons. But firing him now isn't going to fix anything. Shaking up the team is going to help them win any more games. Be mad at Dave Dombrowksi for hiring him in the first place. Be mad at Al Avila for keeping him on board for 2016. But there's no sense being mad at the guy who never pulled any punches about who he was from the start. "People got the thought that, because of my age and my background, I'm a sabermetrician. I'm really not." He told us this in 2014, before he'd managed even one game. We just didn't want to believe him. I heard a statistic the other day that something like only 5 percent of teams who fired their manager mid-season improved their record after doing so. That only stands to reason. The Tigers have definite needs right now, but adding an element of disruption at this point is not one of those needs.